Verify before you start production! It’s never been easier to find suppliers in today’s Internet age. However, this easy access has also opened up possibilities of sub-standard goods or quality issues which can lead to serious losses or damage a brand’s reputation. Our Pre-Production Inspection Service can greatly reduce this risk for you, especially when it is agreed in advance with the supplier. When is a Pre-Production Inspection Used? The pre-production inspection is the second most commonly used inspection after the Pre-Shipment inspection. A Pre-production inspection is carried out, when the manufacturer has received all the raw materials and components for your product but has not put them on the production line yet. This is a great way to ensure that the supplier is using the components/raw materials that were agreed as changing components over orders due to different reasons (to cut costs, unavailability of components, etc.) is by far the single biggest QC issue that we see. By the time these components have been assembled into a finished product, it can be too late or expensive to change them. Therefore, a pre-production inspection helps avoid that scenario. Our Pre Production Inspection is provided both as an ad-hoc service as well as part of the 360° Sourcing Service, which takes care of the entire Sourcing process for you. *The services mentioned above are part of the 360° Sourcing Process, not of the Pre Production Inspection Service. With the Pre-Production Inspection, an IMEX inspector will visit the factory (or supplier’s warehouse) and physically inspect the goods once all the raw materials have been received but before they have been put on the production line. 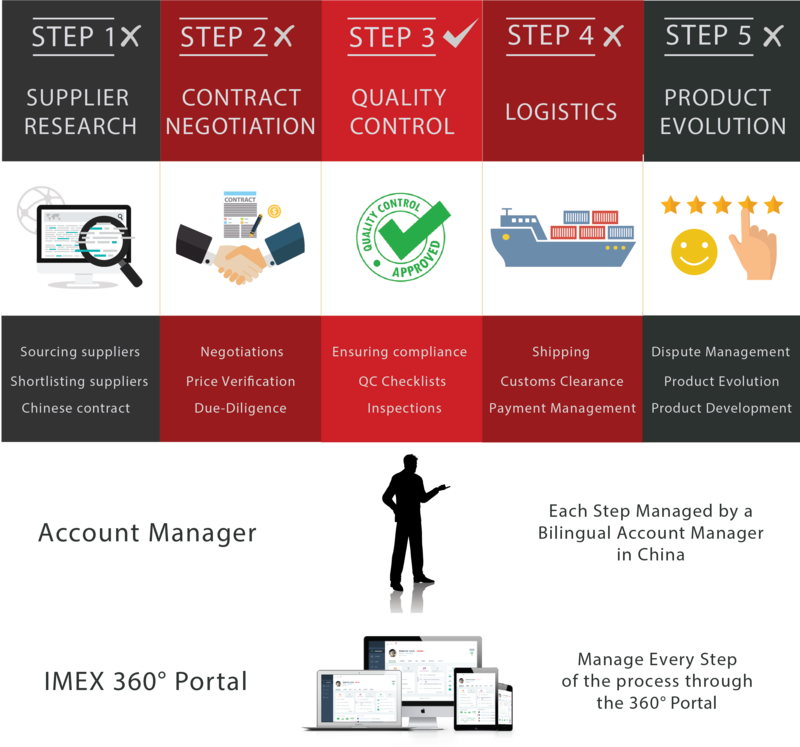 When used as an ad-hoc service, the client provides us with the QC Checklist listing key components/parts and/or samples whereas when used as part of the 360° Sourcing Service your IMEX Account Manager will draw up the parts list for you in Chinese to avoid any issues due to the language barrier. We then send our highly trained quality control inspectors who ensure that the goods conform to the standards set by the client. We provide you with a full report in PDF Format with the inspection results. Quality Standards: We use internationally recognized AQL levels for all quality inspections. Clients can also set their own acceptable quality tolerance levels (As agreed with their suppliers). Reference Samples: We always encourage our clients to send a “reference sample” wherever possible, as it tells the inspector exactly what the product should look like and how it should function.